Rabbit anti Human, Mouse, Rat RAB8A. Synthetic peptide of human RAB8A. The protein encoded by this gene is a member of the RAS superfamily which are small GTP/GDP-binding proteins with an average size of 200 amino acids. The RAS-related proteins of the RAB/YPT family may play a role in the transport of proteins from the endoplasmic reticulum to the Golgi and the plasma membrane. 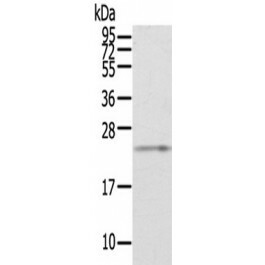 This protein shares 97%, 96%, and 51% similarity with the dog RAB8, mouse MEL, and mouse YPT1 proteins, respectively and contains the 4 GTP/GDP-binding sites that are present in all the RAS proteins.